Select boats for sale in northwest Vermont at local boat dealers and outdoor centers offering a wide variety of boat types. Listed by proximity to major cities and waterways, you can find new and used boats for sale in your section of the state. Find boat dealers and other resources offering pontoon boats, fishing boats, family boats, yachts, sailboats, aluminum boats and others in northern and western Vermont. Listed below find boat dealers and other resources offering boats for sale. Each dealer represents one or more boat manufacturers. In addition to new boats, most carry a variety of used boats for sale. Dealers are listed nearby cities and attractions. Cities listed include Burlington, Shelburne, St Albans, Vergennes and Waterbury. Contact them to see if they have the right boat for you. 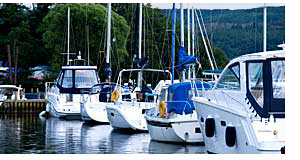 Locate boat dealers and other boat sales locations by region, then within or nearby cities in western and northern Vermont. If you are looking for a specific model boat for sale, chances are one of these dealers can help. Boats offered include sailboats, family boats, yachts, pontoons, cruisers, cuddy cabin boats, canoes, car toppers, fishing boats, inflatables, jon boats, ski boats, deck boats, aluminum boats, electric boats, jet skis, yachts, luxury watercraft and others. Click here to locate resources for boating gear and accessories in northwest Vermont. If your interest is fishing, click here to find aluminum fishing boats in northern and western Vermont. If you are looking for boat storage in Northwest Vermont, you may want to contact marinas on the lake where you prefer to go boating. Marinas including Malletts Bay Marina, North Hero Marina and Shelburne Shipyard either offer boat storage or can refer you to a resource for storing your boat.